Seventy-five percent of teens say learning more about money management is one of their top priorities and the H&R Block Budget Challenge is helping teens do just that in classrooms nationwide. 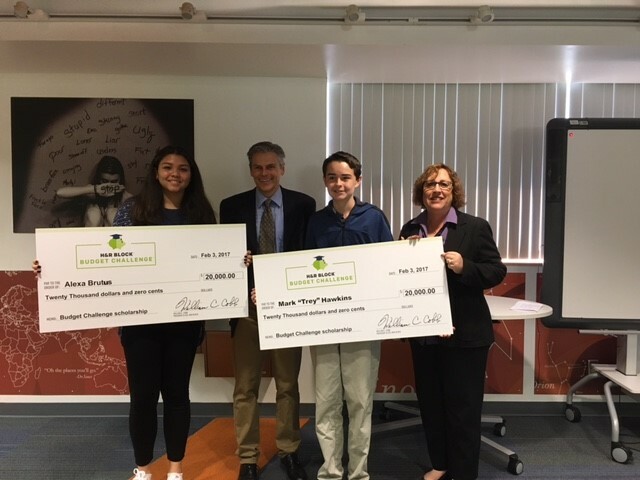 Through this program, thousands of teens are preparing for the financial trials of adult life, and this month H&R Block awarded $100,000 in scholarships to acknowledge the exemplary budgeting, saving and investing skills of five students from the fall 2016 Budget Challenge. Studies show money is one of the biggest stressors for Americans, and many people don’t feel confident managing their finances. The H&R Block Budget Challenge gives students the opportunity to learn with and compete against students from all 50 states for scholarships in a game-like environment. During the 10-week program, students pay bills, manage expenses, save money, invest in retirement and pay taxes as if they were recent college graduates. Alexa Brutus and Trey Hawkins of Bradenton, Fla.; Billy Balfour of St. Clair, Mich.; and Micah Bong and Saad Khawajal of Sugar Land, Texas, each earned $20,000 scholarships for being the most “real-world ready” of more than 73,000 students learning and competing in the fall Budget Challenge. 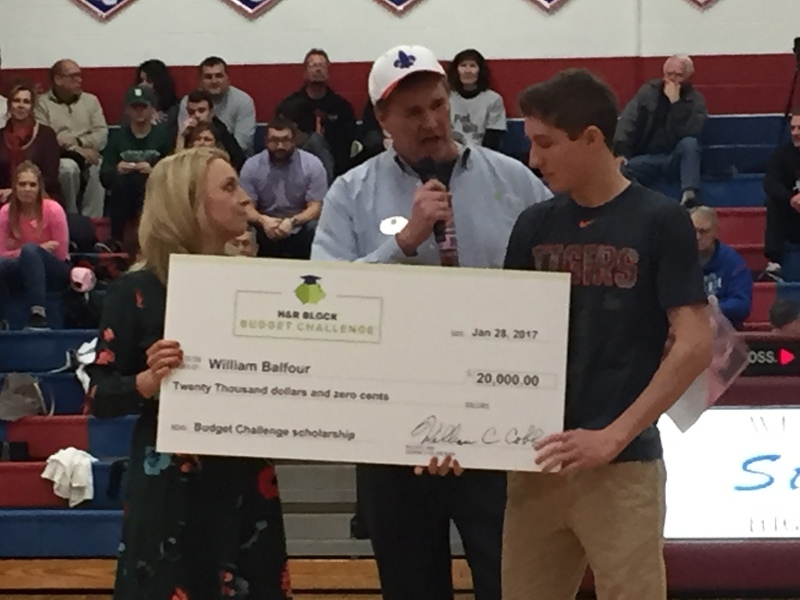 Winner Billy Balfour was taught about personal finance growing up, but he says it didn’t click for him until he participated in the H&R Block Budget Challenge. “Learning about personal finance was a huge priority for me. Even though I grew up talking about budgeting with my parents, it never really made sense to me until I had to do it myself,” said Balfour. Balfour’s teacher Amanda Volz of St. Clair, Mich., has taught personal finance using the H&R Block Budget Challenge for three years and has found the program to be rewarding year after year for her students. The H&R Block Budget Challenge is part of H&R Block Dollars & Sense, an initiative that has helped more than 1 million teens become more real-world ready by giving them the knowledge they need to manage their money. This year, over 3,500 high schools received free H&R Block Budget Challenge curriculum. Since starting the Budget Challenge three years ago, more than 450,000 high schoolers have benefitted, more than $6 million in scholarships and prizes have been awarded and five additional national winners will be announced in May. To learn more visit www.HRBDS.org. Editor’s Note: Current winners and former participants – including students and teachers – are available to share their personal experiences with the H&R Budget Challenge. H&R Block, Inc. (NYSE: HRB) is a global consumer tax services provider. Tax return preparation services are provided by professional tax preparers in approximately 12,000 company-owned and franchise retail tax offices worldwide, and through H&R Block tax software products for the DIY consumer. H&R Block Dollars & Sense is committed to increasing teens’ financial fitness by providing practical financial skills and has helped more than 1 million teens become more real-world ready. For more information, visit the H&R Block Newsroom, www.HRBDS.org or follow H&R Block on Twitter, Instagram or Facebook. Based out of Cincinnati, Ohio, ProperLiving, LLC owns and operates the Budget Challenge Personal Finance Simulation, which received a U.S. Patent in May 2013.